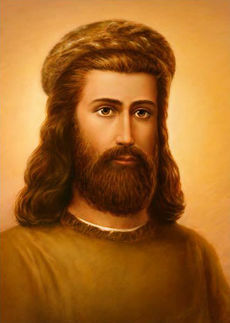 The ascended master Kuthumi, formerly chohan of the second ray of wisdom, now serves with Jesus in the office of World Teacher. He is the head master of the Brothers of the Golden Robe and trains students who are on the ray of wisdom in the art of meditation and the science of the Word in order that they may become master psychologists of their own psyche, or soul. As Pharaoh Thutmose III (c. 1567 B.C. ), greatest of pharaohs, prophet and high priest, patron of the arts, he is considered the architect of the Egyptian empire. He expanded the Egyptian kingdom to include most of the Middle East. His most decisive victory was on the battlefield near Mt. Carmel. There he led the entire army single file through narrow Megiddo Pass to surprise and defeat an alliance of 330 rebellious Asian princes—a daring maneuver protested by the pharaoh’s terrified officers. Thutmose alone was assured of his plan and rode ahead holding aloft the image of Amon-Ra, the Sun God who had promised him the victory. In the sixth century B.C., he was the Greek philosopher Pythagoras, the “fair-haired Samian” who was regarded as the son of Apollo. As a youth, Pythagoras conferred freely with priests and scholars, eagerly seeking scientific proof of the inner law revealed to him in meditation upon Demeter, the Mother of the Earth. His quest for the great synthesis of truth led him to Palestine, Arabia, India, and finally to the temples of Egypt, where he won the confidence of the priests of Memphis and was gradually accepted into the mysteries of Isis at Thebes. When Asian conqueror Cambyses launched a savage invasion of Egypt about 529 B.C., Pythagoras was exiled to Babylon, where the prophet Daniel still served as king’s minister. Here rabbis revealed to him the inner teachings of the I AM THAT I AM given to Moses. Zoroastrian magi tutored him in music, astronomy and the sacred science of invocation. After twelve years, Pythagoras left Babylon and founded a brotherhood of initiates at Crotona, a busy Dorian seaport in southern Italy. His “city of the elect” was a mystery school of the Great White Brotherhood. 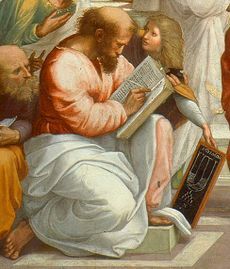 Pythagoras delivered his lectures from behind a screen in a veiled language that could be fully comprehended only by the most advanced initiates. The most significant phase of his instruction concerned the fundamental concept that number is both the form and the essence of creation. He formulated the essential parts of Euclid’s geometry and advanced astronomical ideas that led to Copernicus’ hypotheses. It is recorded that two thousand citizens of Crotona gave up their customary lifestyle and assembled together in the Pythagorean community under the wise administration of the Council of Three Hundred—a governmental, scientific and religious order that later exercised great political influence throughout Magna Grecia. Pythagoras, the “indefatigable adept,” was ninety when Cylon, a rejected candidate of the mystery school, incited a violent persecution. Standing in the courtyard of Crotona, Cylon read aloud from a secret book of Pythagoras, Hieros Logos (Holy Word), distorting and ridiculing the teaching. When Pythagoras and forty of the leading members of the Order were assembled, Cylon set fire to the building and all but two of the council members were killed. As a result, the community was destroyed and much of the original teaching was lost. Nevertheless, “the Master” has influenced many great philosophers, including Plato, Aristotle, Augustine, Thomas Aquinas, and Francis Bacon. As Balthazar, one of the three Magi (astronomer/adepts) who followed the star of the Presence of the infant Messiah, he was said to have been the King of Ethiopia who brought the treasure of his realm as the gift of frankincense to Christ, the eternal High Priest. As Francis of Assisi (c. 1181–1226), the divine poverello, he renounced family and wealth and embraced “Lady Poverty,” living among the poor and the lepers, finding unspeakable joy in imitating the compassion of Christ. While kneeling at Mass on the feast of St. Matthias in 1209, he heard the gospel of Jesus read by the priest and the Lord’s command to his apostles, “Go, preach.” Francis left the little church and began evangelizing and converting many. Among them was the noble Lady Clare, who later left her home dressed as the bride of Christ and presented herself to Francis for admittance to the mendicant order. One of the many legends surrounding the lives of Francis and Clare describes their meal at Santa Maria degli Angeli, where Francis spoke so lovingly of God that all were enraptured in Him. Suddenly the people of the village saw the convent and the woods ablaze. Running hastily to quench the flames, they beheld the little company enfolded in brilliant light with arms uplifted to heaven. As Shah Jahan (1592–1666), Mogul emperor of India, he overthrew the corrupt government of his father, Jahangir, and restored in part the noble ethics of his grandfather Akbar the Great. During his enlightened reign, the splendor of the Mogul court reached its zenith and India entered her golden age of art and architecture. Shah Jahan lavished the imperial treasury on music, paintings, and the construction of awesome monuments, mosques, public buildings and thrones throughout India, some of which may still be seen today. The famous Taj Mahal, “the miracle of miracles, the final wonder of the world,” was built as a tomb for his beloved wife, Mumtaz Mahal. She had ruled by his side almost as an equal and died in 1631 giving birth to their fourteenth child. 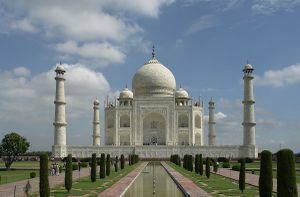 Shah Jahan spared no effort in making the monument “as beautiful as she was beautiful.” It is the symbol of the Mother principle and celebrates his eternal love for Mumtaz. In his final embodiment, the adept Kuthumi was revered as a Kashmiri brahman, Koot Hoomi Lal Singh (also known also as Koot Hoomi and K.H.) Koot Hoomi led an extremely secluded life, affording but a fragmented record of his words and works. Born in the early nineteenth century, Mahatma Kuthumi was a Punjabi whose family had settled in Kashmir. He attended Oxford University in 1850 and is believed to have contributed “The Dream of Ravan” to The Dublin University Magazine around 1854, prior to returning to his homeland. The Kashmiri Brahman spent considerable time in Dresden, Würzberg, Nürnberg and at the university of Leipzig, where in 1875 he visited with Dr. Gustav Fechner, the founder of modern psychology. His remaining years were spent in seclusion at his lamasery in Shigatse, Tibet, where his contact with the outside world included didactic writings sent by mail to some of his devoted students. These letters are now on file with the British Museum. With El Morya, known as the Master M., Kuthumi founded the Theosophical Society in 1875 through Helena P. Blavatsky, commissioning her to write Isis Unveiled and The Secret Doctrine. The purpose of this activity was to reacquaint mankind with the wisdom of the ages that underlies all of the world’s religions, the inner teachings guarded in the mystery schools since the last days of Lemuria and Atlantis. This includes the doctrine of reincarnation—which, we note, Saint Francis preached in the village squares—as well as an understanding of the ascension as the goal of life sought knowingly or unknowingly by every son and daughter of God. The Theosophical Society has published Kuthumi’s and El Morya’s letters to their students in The Mahatma Letters and other works. Kuthumi ascended at the end of the nineteenth century. This dispensation is my assignment to work with each one of you individually for your physical health and for the healing of your psychology, that we might swiftly get to the very cause and core of physical as well as spiritual and emotional conditions that there be no more setbacks or indulgences and surely not two steps forward and one step back. Kuthumi has given a key to understanding our psychology in his teachings on the dweller-on-the-threshold and the electronic belt. The momentums of untransmuted karma in orbit around the “nucleus” of the synthetic self (or carnal mind) form what looks like an “electronic belt” of misqualified energy around the lower portion of man’s physical body. Diagrammed at the point of the solar plexus, extending downward in a negative spiral to below the feet, this conglomerate of human creation forms a dense forcefield resembling the shape of a kettledrum. Referred to as the realm of the subconscious or the unconscious, the electronic belt contains the records of unredeemed karma from all embodiments. At the eye of this vortex of untransmuted energy is the consciousness of the anti-self personified in the dweller-on-the-threshold, which must be slain before one can attain full Christhood. The master can better help us if we give his mantra, “I AM Light.” This mantra is for the development of a tremendous momentum of white light and the wisdom of God. It is to bring us to the realization that God can and does dwell within us. When we draw nigh to him, he draws nigh to us, and the angelic hosts also gather for the strengthening of the aura. In his book Studies of the Human Aura, Kuthumi speaks of a threefold exercise using the “I AM Light” mantra that students can give for the purpose of strengthening the sheath of the aura so that they can maintain the consciousness of Christ, of God, of Buddha, of Mother. This day I AM a focus of the Central Sun. By human thought and feeling. I AM an outpost of the Divine. By the mighty river of light which I AM. I live, I live, I live in light. I AM light’s purest intention. The purpose of the kingdom of heaven. Kuthumi is hierarch of the Temple of Illumination in Kashmir, which is also known as the Cathedral of Nature. From the focus of his etheric retreat at Shigatse, Tibet, Kuthumi plays celestial music on his organ to those who are making the transition called “death” from the physical plane to higher octaves. So tremendous is the cosmic radiation that pours through that organ—because it is keyed to the music of the spheres and an organ-focus in the City Foursquare—that souls are drawn out of the astral plane as if following a pied piper. In this way, thousands are drawn to the retreats of the masters by the great love of this Brother of the Golden Robe. Those who are able to see Kuthumi at the moment of their passing often find peace in the certain knowing that they have seen the master Jesus, so closely do Jesus and Kuthumi resemble one another in their adoration and manifestation of the Christ. Jesus and Kuthumi, Prayer and Meditation. ↑ Kuthumi, “Remember the Ancient Encounter,” Pearls of Wisdom, vol. 28, no. 9, March 3, 1985. This page was last modified on 19 February 2019, at 00:37.